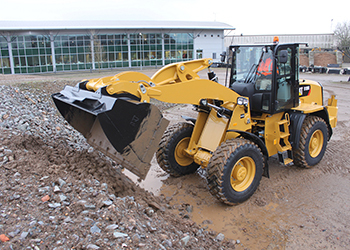 The new Cat 918M compact wheel loader. Caterpillar and its German dealer, Zeppelin Baumaschinen, will exhibit a suite of technologies, services and equipment at bauma 2016 under the theme ‘Built for It’. Over a display space totalling more than 8,200 sq m, the company will showcase safety, productivity and equipment management solutions, as well as more than 60 Cat products, a large selection of work tools and a full complement of dealer-delivered support services — all designed to make customers more successful, says a company spokesman. The highlights of its showcase include: Cat Connect Technology, base hardware or software technology, such as Link, Grade and Compact, and Payload; Cat 360-degree Advantage to help overcome jobsite challenges; and Leverage Every Litre, which helps recover more profit from every litre of fuel burnt. Also on display will be product support services that protect the customer’s equipment investment and maximise its value. Dozens of machines for construction, mining, industrial, waste and forestry applications will be showcased too, all equipped with Cat technologies that improve safety, efficiency and customer satisfaction. Among the featured machines are: The 336F LN XE and 352F L XE excavators; the new 323F excavator with standard Cat Grade with Assist; 340F long reach excavator; 966M XE wheel loader with advanced power train design; D6N with Slope Assist; 299D2 XHP multi-terrain loader; the new 918M compact wheel loader, which meets EU Stage IV/US EPA Tier Four Final emission standards; and the TH3510D, a 3.5-tonne, 10-m reach telehandler. Three new pavers will be part of the exhibition: The AP300F, AP355F and AP555F are built with intuitive, accessible technology and a quick-heating screed system that increases productivity and reduces crew idle time. All are powered by engines that meet EU Stage IV/US EPA Tier Four Final emission standards. Also showcased will be a new CD54B drum vibratory compactor with technology enhancements for the operator. Separately, the mining area of the exhibition will showcase the new 6015B hydraulic mining shovel, built with class-leading speed and power and optimised to load the Cat 773, 775 and 777 trucks in four, five and seven passes, respectively. Furthermore, industrial engines meeting EU Stage IV/US EPA Tier Four Final emission standards will be on display in multiple areas with the C7.1 Acert engine that delivers up to 225 bkW.